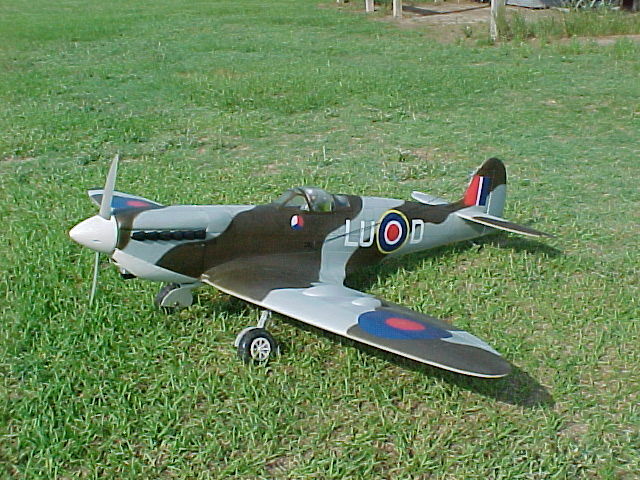 For you WW 2 buffs I am in the middle of a Top Flite Spitfire project. I accquired this kit at an auction for a good price. At the time I purchased it the tail feathers were completed and the wing was half way framed up. I took it from there. Check back often for a first-hand view inside my workshop. I have been working on this kit off and on for about a year and I am sorry to say that I dont have pictures of the framing phase. The picture here is just after the top framing of the fuse was completed. I have already installed the robart retracts and the two servos in the wing for each aileron. 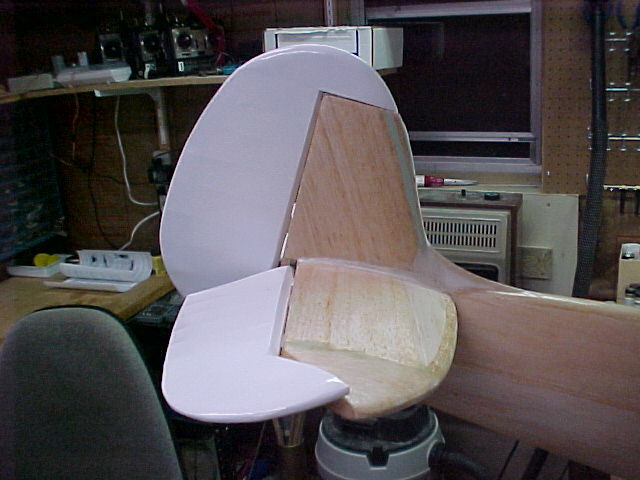 There is one servo in the wing center section for both flaps. The framing went very fast. 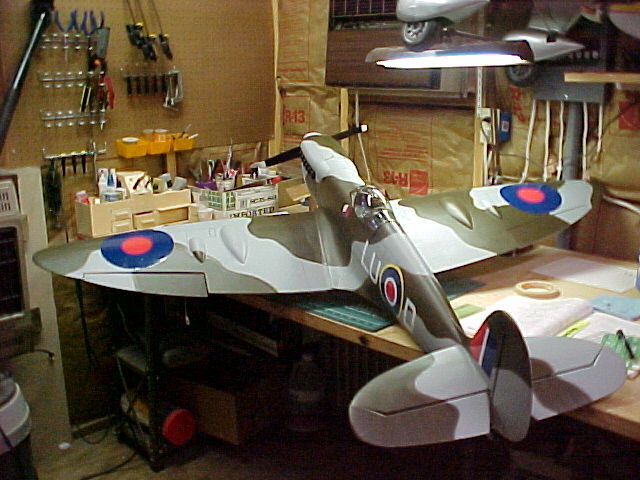 As with most Top Flite kits there are a fair number of parts and alot of steps. The instructions are excellent with most steps explained with a picture. (Close ups are worth a thousand words). The only trouble I had was sheeting the complex curves of the rear of the fuse. I used my own 3/16" thick balsa sheet for the fuse and I had trouble getting the sheet to conform without breaking or buckeling. Yes I did wet it down and alot with a mixuture of water and amonia. With a little bit of cutting and cussing it formed but not to my satisfaction. Next time I will plank the fuse at least from the cockpit back! 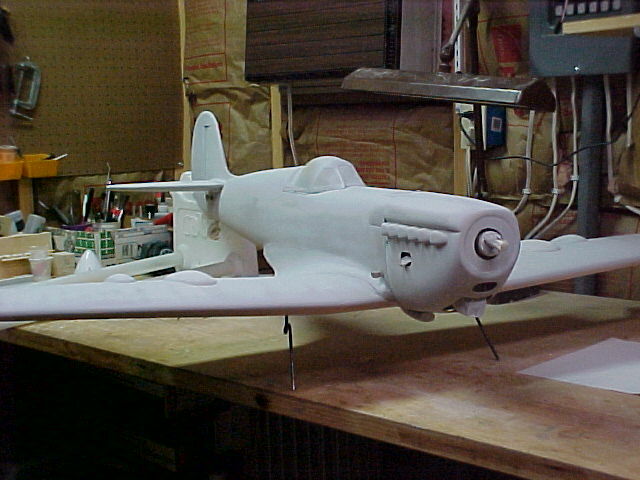 This picture shows the aircraft after several more steps have been completed. Sorry about the lack of pics but I didnt decided to post this project until recently. 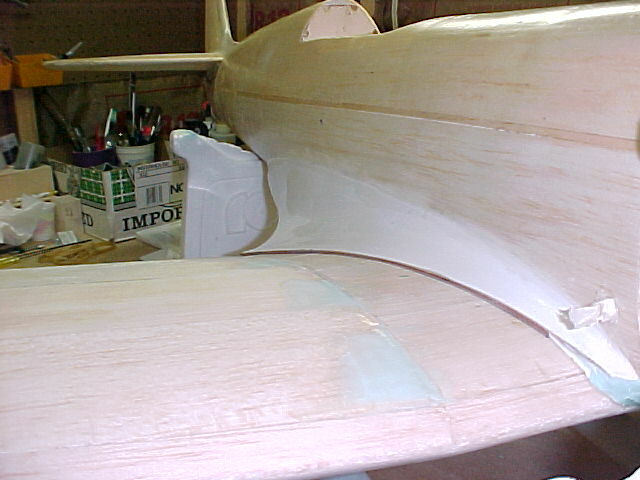 All of the structure was sanded and filled and prepared for fiberglassing. 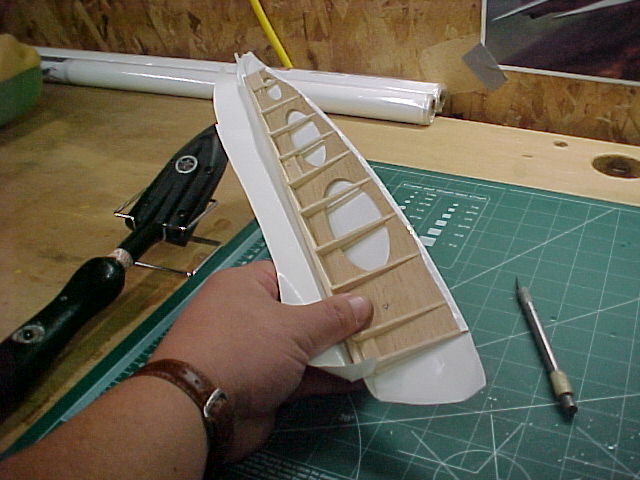 I decided to go this route because I wanted to add more strength to the sheet balsa surface. I fiberglassed the surface with .5 oz cloth and Sigs polyester resin. If you are careful with the resin this technique should not come out to be much heavier than monokote. Both coats were applied and the model is now ready for sanding. 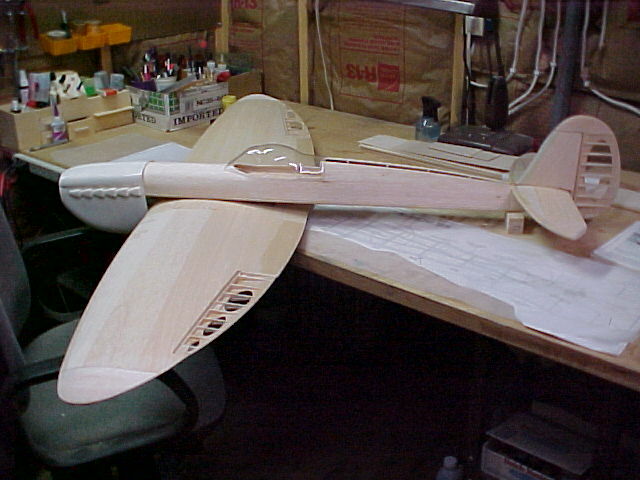 Before that is done I will cover the tail feathers and ailerons with fabric covering (see next pic). The covering of these tail feathers was not difficult. I used Century 21 fabric covering. It goes on just like monokote and was shrunk with a blow iron. 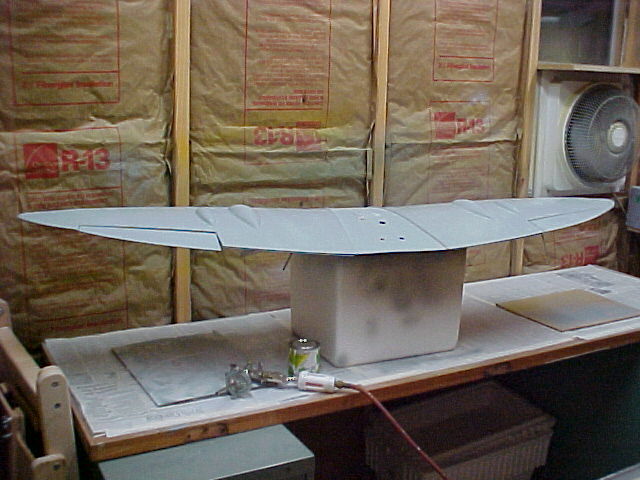 The wing was sanded first with 80 grit paper, then with 120 grit. You can see from the picture on the right that the fit between the fillet and the wing is very poor. To make a smooth transition between these two surfaces I used hobbico balsa filler, but you can also use any other suitabel filler. Just be sure you use mold release wax on the fuse fillet side to keep the filler from sticking on the fuse. 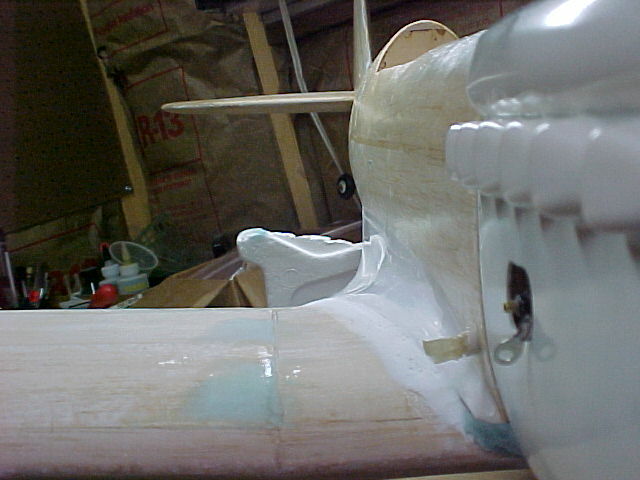 Here I have added the wax release and then the balsa filler. Once it dries you can final sand it to shape. Unscrew the wing hold down screws and carefully pop the wing loose. 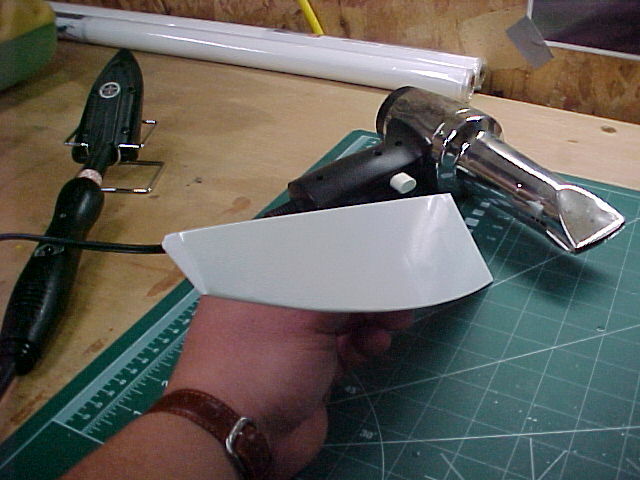 You will most likely loose some of the filler in the process. Not to fear, just add more release wax, put the wing back on, and refill. Once complete I usually add some polyester resin to harden the filler. You can also use thin CA. 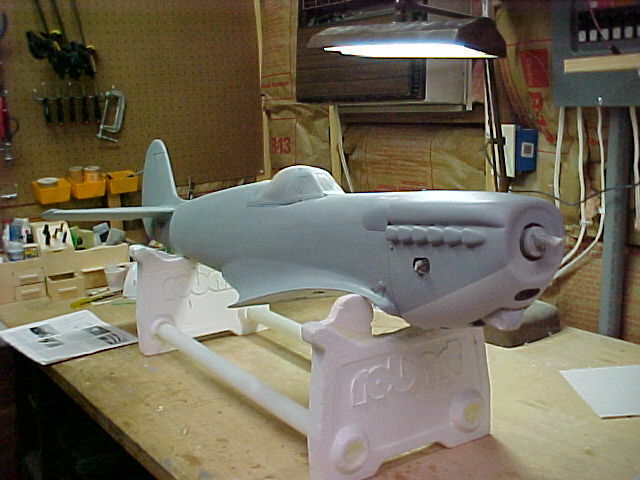 I decided to use Hobby Poxy primer which is a two part epoxy. It fills and sands really well but use it sparingly because it can add weight really fast. How do you mix this? I premix part B (catalyst) with thinner on a 1:1 ratio. When I paint I use an automotive touch up gun and put part A (paint) in the cup (maybe 1 ounce) and 2 parts of the premix (2 ounces). This gives you a 1:1:1 ratio of partA,B and thinner. If the primer is a little too thick to spray you can add a little more thinner until it sprays instead of splatters. Begin by lightly dusting a coat to begin with and applying a heavier coat after about 2 to 3 minutes. This will keep the paint from running. 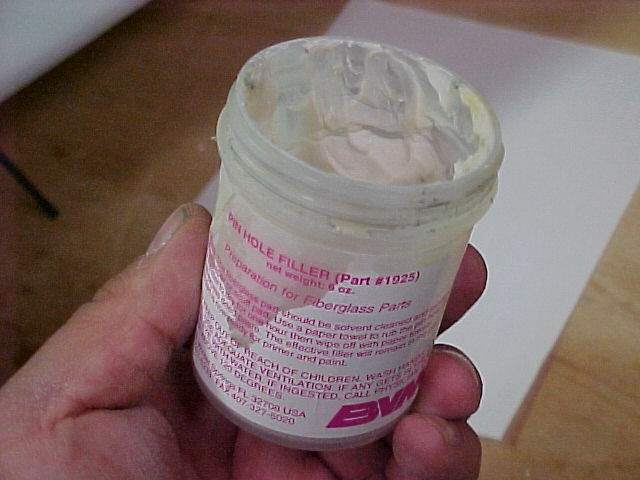 After the sanding is finished I will fill any fiberglass pinholes with the pinhole filler paste. This comes from BVM models and works pretty well. I have now finished applying the olive cammo color on the fuse and applied the decals. The perfect paints are really easy to work with, no mixing of two parts. Just thin a little to spray and paint! I have removed the canopy masking since I am finished with the top coat on the fuse. You can now see the pilot. 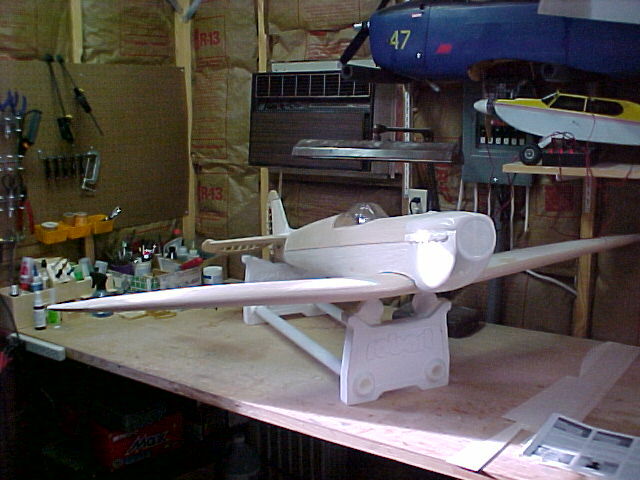 As I mentioned earlier, I did not detail the cockpit due to such a small cockpit area, lack of space, time, and also because I want to keep this a simple fun scale plane. This is a detailed close up of the engine installation. 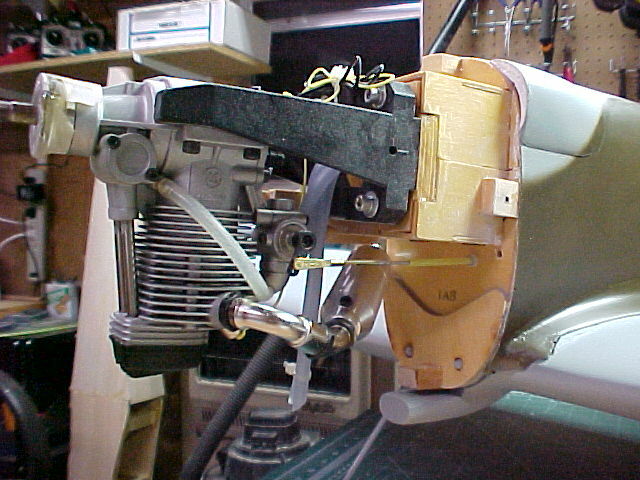 This is an OS 91 FS SurpassII with pump. Fuel line goes to a Dubro fueler and I have two overflow lines out the bottom of the cowl. No muffler pressure should be needed because of the pump. If you use the 45 degree muffler header your muffler will stick way out of the side of the cowl (very Ugly). You can see that I purchased an additional 90 degree header and fitted it to the engine, then attached the 45 elbow to the muffler. This keeps the muffler in the cowl and exposes just the muffler tip out the opposite side. Very close to finishing! Camo is complete and I have added some panel lines with a pen. Lustercoat has been added to the decals to flaten them out. All that is left is to install the radio, check the CG, cycle the gear, adjust the throws, and break the engine in. I will follow up with some final pictures and a quick review of the flying characteristics. Stay tuned! The model was tested on Wednesday May 30th successfully! The final weight turned out to be about 11 pounds (about 30 oz. of weight in the nose to balance it correctly) which gives it a wing loading of about 37 oz/sq.ft. 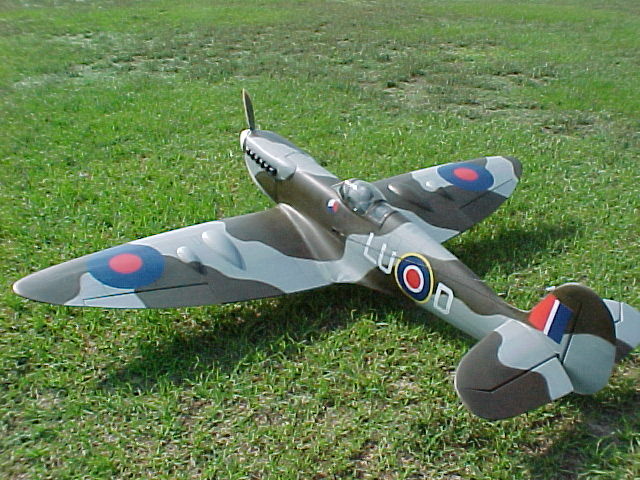 I thought this was hight for a small model but it behaved well during flight. I had to keep up elevator during taxing because my model nosed over quite a bit. Take off was smooth, a little right rudder and ease off of the up elevator once you get it tracking straight. Full power and she climbs out at a good rate with the OS 91FSII pumped. 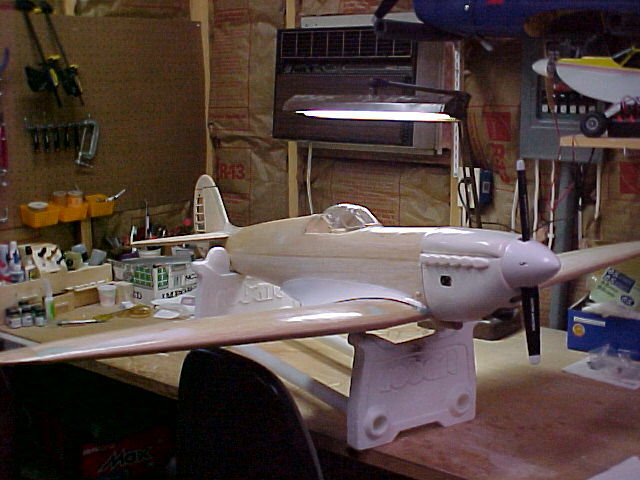 Very little trim needed (some aileron and elevator). First thing was to test the stall characteristics... at stall the model just nosed over and began sinking, no tip stall or snap!! Great. Once she did stall, it took about 50' of air to get speed up again so you dont want to slow it down too much on landing. I cruised at about 1/2 throttle going about 50 mph. Turns are smooth, gentle, and "on rails". Loops are graceful and small. Rolls are very slow and graceful as well. Downwind landing was completed at about 1/3 throttle and base to final completed at about 1/4 throttle. Very little evevator is needed, let her sink until she in over the end of the runway then when the model is about 2' off the ground cut throttle and give her some up elevator for the flair. I think I was flying at about 35 mph at touchdown. Even though I built in the flaps they were not really needed. In two words to explain the flight, an aeiral ballet, smooth, graceful, and beautiful. This one is a keeper! I hope you have enjoyed this site, thanks for keeping in touch. 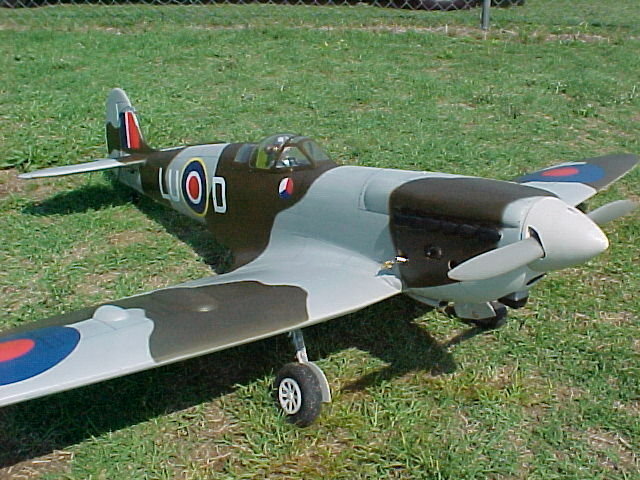 The next plane on my list is the Dynaflite Chipmunk. See ya then. Advertised weight: 6.5 to 7.5 lbs. 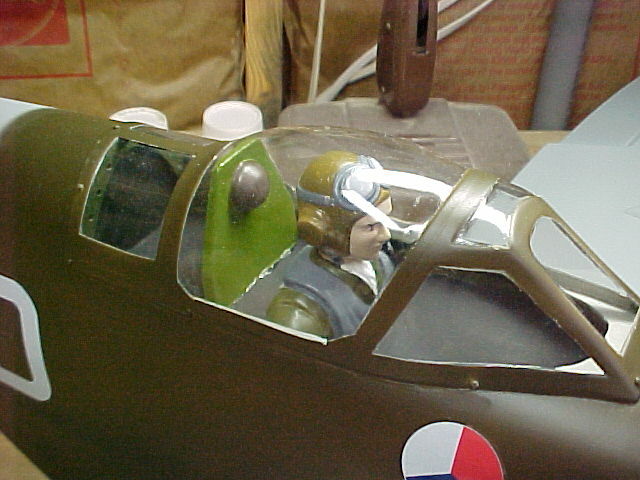 Other scale options such as pilot, cockpit, etc. available from Top Flight.